This breed is one that enjoys traveling in packs. The English Foxhound is a common household pet, but they are natural watchdogs, so do use caution is you are intimidated by a stern dog presence. They can easily reside peacefully with little ones and other dog as well as strangers in the home, when trained properly. Being a scent hound, they utilize their excellent sense of smell to afford them a great life of hunting. They enjoy exercise and can still remain very sweet at times. These dogs have a tendency to run or bay, and they also enjoy running in large open spaces, making them not an ideal breed to try to reside in a small apartment in the city somewhere. This is one type of hound that is on the simple side of caring for. The English Foxhound is born to run and to run for very long distances. For the avid jogger, they may have found the best furry companion by choosing the English Foxhound as a pet. They are easy to care for in any temperature circumstances, be those warm or cold ones. Their fur coating will need occasional grooming, but nothing out of the ordinary for any dog owner. They do bark when needed, and possess a deep tone in their voices. Some, but not all of them bode a more rounded shape ear than others. Similar to the American Foxhound, the English Foxhound is very simple to care for. they do not require a good bit of effort on a daily basis, as they are fully capable of caring for themselves for the most part. They are very independent creatures and can rarely develop issues with renal disease and CHD. Hip testing as the hound ages will be recommend generally by the vet. The average lifespan of the English Foxhound is between ten and thirteen years long. On average, they weigh fifty five to seventy five pounds as full grown canines and generally stand around two feet tall. 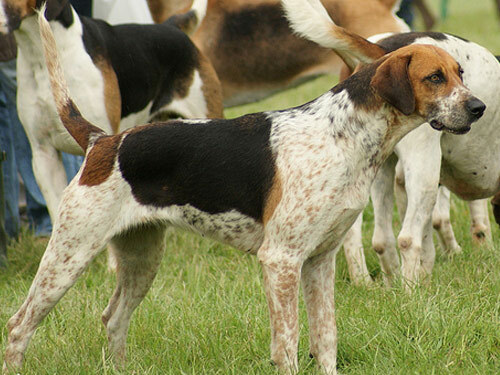 The English Foxhound has been noted as deriving from Great Britain, however it is not confirmed as a truth thus far. When the very first English Foxhounds were discovered in the 1700's, they were not as popular as the Greyhound breeds at that present time. However, it did not take long for hunters around the area to notice their keen sense of smell that the English Foxhounds possessed. While these canines could easily spot, keep up with and attack the fox, they were not very active at completing the mission, as in actually killing the fox. Registered previously in England, they ended up also being registered in the United States in the 17th century sometime. Most of this breed is not well known for being a successful show dog, although they are beautiful canines. They are currently and most likely will be for many years to come, the hound of choice for humans that adore hunting as these dogs are fantastic companions for anyone with a love of the great outdoors.